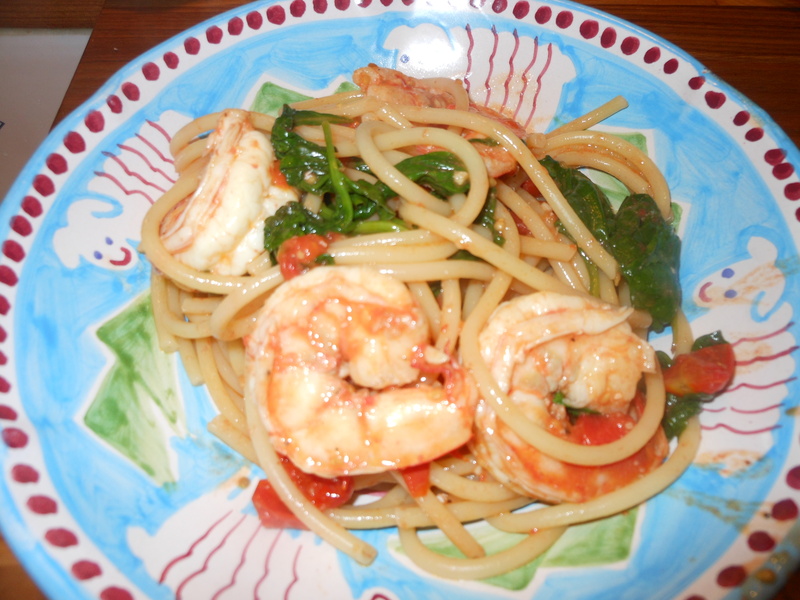 I love the recipe with Chicken, Spinach , Tomatoes and Pasta so much that I decided to make it with Shrimp. It turned out as delicious as I imagined it would. My daughter and grandsons are out here visiting, and I wanted to make a special dinner for her first night. I didn’t feel like making chicken again, so I made the basic recipe but changed it around a little bit for the shrimp. How can this be bad?? With cooking you can mix and match and screw around with the recipes, more or less seasonings, etc. With baking you really can’t, when you start substituting it gets very dicey and I don’t recommend doing it unless you’re just screwing around in the kitchen. There is nothing worse than going to the effort and expense of baking and having to scrap the whole cake because you tried to change an ingredient. Usually with baking , I follow the directions carefully and try new ingredients before I will make them for any one else. With cooking you can be more flexible and be a bit more daring. There is definitley room for error with cooking but not with baking. Baking is much more precise a science. Heed the advice and have fun with this recipe. This is what I did. 2 boxes Cherry Tomatoes or little grape type tomatoes. During the summer you may want to use some of those beautiful fresh tomatoes either from your garden or from the farm stand. In the winter months stick with the small cherry types. I was able to obtain some fresh cherry tomatoes grown locally and they were sweet and delicious. Shrimp , we used Ocean Garden brand or any Mexican White Shrimp shell on whites under 10 – 15 size. Use whatever you like but I highly recommend this brand. I used enough for the three of us about 5 pieces each ( they are nice size) and cooked up the rest for shrimp cocktail for the next day. Joel recommends using Mexican White Ocean caught shrimp. The under 10 size means there are under 10 to a pound. These are the perfect size for shrimp cocktail and many dishes. They are rather costly though. Ask your seafood person for help , you’d be surprised how a little knowledge goes a long way in this area. We buy it by the box (5 lb.) and it comes frozen in a block. It gets defrosted, cleaned and deveined. You can also go into your local fish store and buy 1 lb. of shrimp about 10 – 15 to a lb. and have them clean it and devein it. We prefer the shrimp from Mexico or Equador, ask for white shrimp from Central or South America. 1 lb. of spaghetti , I used perciatelli type of pasta. Use whatever type you like. Cook pasta according to directions. Drain and set aside. I like to keep a cup of the pasta water in case I need a bit more liquid for finishing the sauce. I always do this. Clean and devein shrimp. Thank goodness Joel does this for me, but you can ask them in your seafood dept. or fish store to do this they usually will, it takes a lot of the work out of it. Cut small tomatoes in 1/2, if you are using larger tomatoes just chop up. Heat olive oil over medium high heat, turn heat down to low and add garlic for about a minute. Pour in wine and broth , raise the heat and allow the liquid to come to a boil. Allow the liquid to boil for a few minutes and it will reduce , cooking liquid should reduce by at least 1/2. Lower to a simmer and add tomatoes, I let them cook for a while, probably 1/2 hour or so for this sauce. The tomatoes will release their liquid a bit, and soften up . Sprinkle some kosher salt and pepper now on tomatoes. ( about 1/2 teaspoon of kosher salt) and a few grinds of the black pepper ( to taste) Let tomatoes simmer, while you cook shrimp. You can always turn heat off, and just turn back on when you’ll add the shrimp. I pat shrimp dry on some paper towels, and sprinkle with kosher salt and pepper. This entry was posted in pasta, seafood, shrimp and tagged and Tomatoes, Pasta with Shrimp, Shrimp, Spinach, Spinach and Tomatoes. Bookmark the permalink.